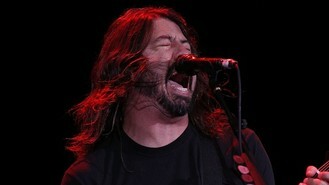 The band, fronted by Dave Grohl, plan to take in venues in England and Scotland in 2015, including two shows at Wembley Stadium over the summer, according to NME. UK dates for the tour are Sunderland Stadium Of Light on May 25, Manchester Emirates Old Trafford on May 27, Wembley Stadium on June 19 and 20, and Edinburgh Murrayfield Stadium on June 23. They will be supported by Iggy Pop and Brighton duo Royal Blood, who Dave recently said he had been impressed by: "I saw some live footage of them, and I was so excited to see a band that was heavy, had riffs, had songs, and could really perform, and an audience that was genuinely excited to watch them play." Tickets will go on pre-sale on November 19 and on general sale at 10am on November 21. Foo Fighters are currently set to enter the Official UK Albums Chart at number two with Sonic Highways this weekend, behind Pink Floyd who look set for the top spot with The Endless River.